Coastal wetlands are important spawning and nursery habitat for various native fishes and are critical in improving fish populations. In 2015, a vegetation assessment by the Ontario Ministry of Natural Resources and Forestry (MNRF) determined that approx. 75% of the coastal wetlands along the Niagara River’s Canadian shoreline were lost due to shoreline hardening. 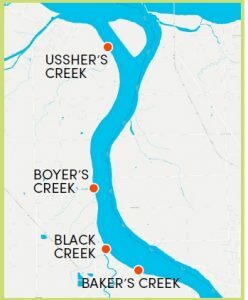 As a result, 7 sites along the Upper Niagara River (from the mouth of Lake Erie to the Falls) were identified as candidates for habitat restoration to fulfill goals of the Niagara River Remedial Action Plan. Habitat restoration in 2016/2017 was completed at Ussher’s Creek and Baker’s Creek. Earlier this year, the Niagara Parks Commission (in partnership with MNRF) completed two coastal wetland habitat restoration projects in the Niagara River at the mouth of Ussher’s Creek and Baker’s Creek. These new coastal wetlands provide essential fish/wildlife habitat and continued shoreline erosion protection using a naturalized approach. Installation of rock and woody debris (ash trees that have succumbed to the Emerald Ash Borer) anchored to the riverbed. What are the benefits of these coastal wetland projects? provide different types of spawning habitat for various fishes. Some fish use the underside of aquatic vegetation or branches to lay eggs while others deposit their eggs onto rocks where they fall between the cracks until they hatch. provide food source and habitat for other wildlife (waterfowl, amphibians, etc.). The Niagara Parks Commission and MNRF are working on plans to complete two more coastal wetland restoration projects in 2017/2018. Ongoing monitoring of the sites and their impact on fish populations has already begun. The Niagara River is a shared resource between Canada and the United States of America but separate remediation efforts occur on both sides of the river. 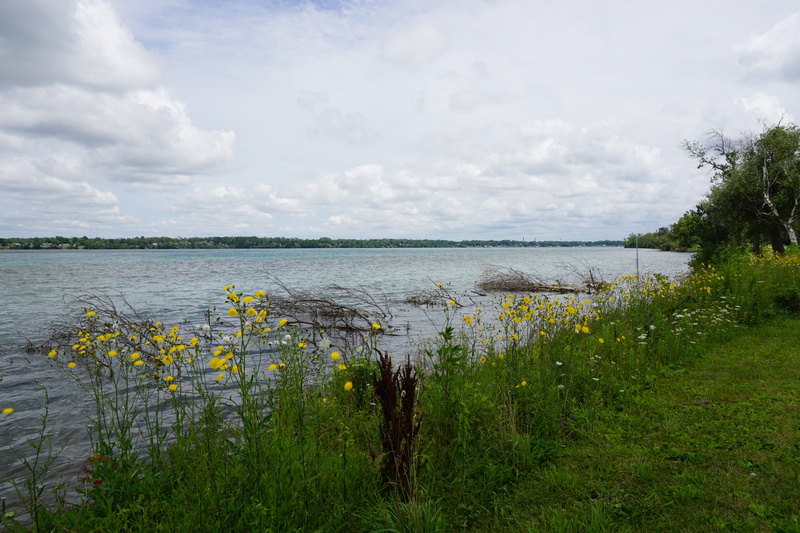 Over the past 5 years, the New York Department of Environmental Conservation has led the restoration of several habitat sites on the U.S. side of the Niagara River. The latest project to expand critical fish and wildlife habitat was completed this September at Strawberry Island, Motor Island and the archipelago known as Frog Island. Read more about these U.S. projects. Because of these and many other restoration efforts, the Niagara River continues to support a diverse ecosystem reliant on healthy waters such as bald eagles, herons, egrets, cormorants, terns, turtles, mink, river otters, lake sturgeon and muskellunge.